Miss Alex White & Francis Scott Key White are sibling rock’n’roll duo White Mystery from Chicago. 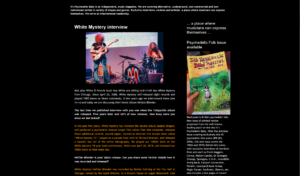 Since April 20, 2008, White Mystery self-released eight records and played 1000 shows on three continents. A few years ago we interviewed them (see here) and today we are discussing their latest album Hellion Blender. The last time we published interview with you was when the Telepathic album was released. Five years later and lot’s of new releases. How busy were you since we last talked? In the past five years, White Mystery has released the double album Dubble Dragon, self-produced a psychedelic feature-length film called That Was Awesome, released three additional records, toured Japan, started an internet live stream show called “White Mystery TV,” played on a parade float with Sir Richard Branson, and released a wooden box set of the entire discography. We played our 1000th show on the White Mystery 10-year band anniversary, which was April 20, 2018, and released our 100th track on that same day. Hellion Blender is your latest release. Can you share some further details how it was recorded and released? White Mystery Hellion Blender was recorded by Dorian Gehring at the Fox Hall in Chicago, owned by the band Ohmme, in a historic house on Logan Boulevard. Like most White Mystery albums, it’s recorded live. Listen to the album, and you’ll hear the classic White Mystery Midwest garage rock sound— until the end, which is spoken word poetry by Francis about the apocalypse. How would you compare it to previous albums? White Mystery Hellion Blender is the culmination of a decade of experimentation and refinement. It came out on a very fancy vinyl via Romanus Records, including a sand-filled, glow-in-the-dark record. What kind of process do you have at mastering material for the release? Record Mastering is a secretive dark art that remains a mystery to many and a mastery to some. How was touring so far? It must be quite exciting to play along Roky Erickson? It’s an honor to support such a legendary musician and it’s inspiring to watch a performer like Roky Erickson triumph over hardships. Look for a collection of magic rings just in time for the holidays and a book the following year. Let’s end this interview with some of your favourite albums. Have you found something new lately you would like to recommend to our readers? Francis has been enjoying Bob Seger’s library and Alex has been whistling high pitched frequencies.